A vast amount of knowledge was gained about the pathology of, and the weather and pasture conditions associated with, FE in the first five decades of awareness of the disease. A number of factors contributed to the delay in identification of the fungus as the cause of FE. The main factors were the lag time between ingestion of the toxic pasture and the clinical signs appearing; the relative unpredictability of the occurrence of the disease, and the very low numbers of diseases being recognised as being caused by fungal toxins at that time. It primarily involves liver damage, though is most often recognized as a form of photosensitisation. The skin becomes hypersensitive to sunlight leading to severe damage of any exposed, non-pigmented skin that has little hair or wool cover. FE affects a number of the flock or herd at once. In most outbreaks, many animals show little or no visible skin lesions, but nevertheless, have suffered liver damage. The signs in cattle include restlessness/agitation, diarrhoea, intense irritation and pain, shade-seeking, reduced appetite, sharp milk drop, raised inflamed white areas of skin which may eventually go hard and slough off in large sheets, significant weight loss, and abortions. Morbidity is usually much less than 50%. FE occurs most often and severely in New Zealand. It also occurs in Australia, Europe and South Africa. In Australia, FE has been observed mainly in east Gippsland, with occurrences also being noted across Victoria, coastal NSW, South Australia and Tasmania. The fungus, Pithomyces chartarum, usually a saprophyte, is most often found on decaying plant material. P. chatarum grows vigorously, and produces spores containing the mycotoxin sporidesmin, in warm and moist weather i.e. minimum night time temperature is over 12-15°C and the humidity is greater than 90% for a few days. Outbreaks of the disease most often occur in late summer and autumn. Sporidesmin is released from ingested spores, carried via the portal bloodstream to the liver where it becomes concentrated in the bile ducts causing a peri-cholangitis. The result is rapid reduction in diameter of bile ducts, potentially progressing to complete blockage. Subsequent build up of phylloerythrin gives rise to the signs of photosensitisation. Eventual fibrosis leads to cirrhosis of the liver. P. chatarum has primarily been associated with perennial rye grass, however this appears to be more to do with the propensity of perennial ryegrass to produce a significant amount of dead leaf litter at the same time as ideal environmental conditions occur for the production of P. chartarum, rather than the fungus having a specific preference for the ryegrass. P. chartarum can live in a build-up of dead leaf litter of any pasture type eg. where pastures have been topped, or cut for hay. Spores are concentrated at the base of the pasture sward. The disease is worse where grazing management encourages animals to graze close to the ground. What can be done to predict occurrence of FE? Monitoring temperature and moisture conditions is not very useful to predict danger periods. 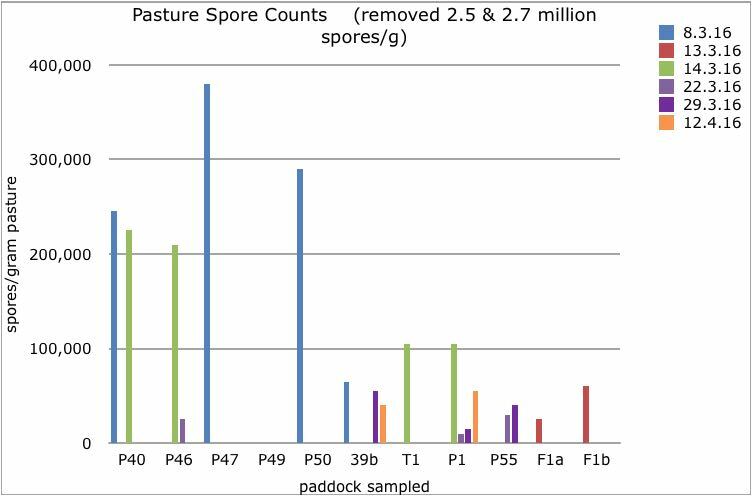 Regular monitoring of spore counts in a selection of paddocks is essential. It involves cutting pasture samples and having the spores per gram of pasture identified. Rising spore counts above 20,000 spores/gram of pasture in combination with favorable weather conditions warrants preventative action. 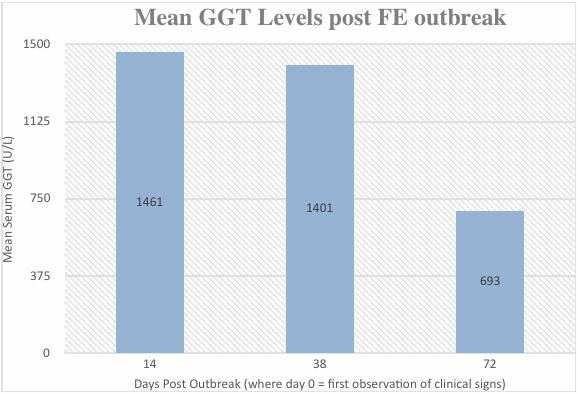 What can be done to prevent outbreaks of FE? Implement grazing management strategies to minimize the risk of spore ingestion. Zinc was determined to be protective against facial eczema in ruminants in the 1970’s, when dosed at approximately 25 times their daily requirement.1. The aim is to maintain the blood serum zinc levels at 20-35 umol/L. To do this, dosage of 20mg elemental zinc/kg liveweight/day is required. Underdosing will result in failure of protection against facial eczema; overdosing can result in zinc toxicity. Administration can be with zinc oxide in feed or by oral drench, or via zinc sulphate in drinking water. The latter is considered unreliable. Therefore, where the risk of facial eczema is significant, administer zinc oxide in the feed or as a drench following strict guidelines regarding method, dose and duration 2-3 weeks before pastures become toxic.3. Blood test for gamma glutamyl transferase (GGT) levels. Spore counts over 100,000 spores/gram of pasture are considered as very toxic. As mentioned previously, concerns start to rise about the potential for FE when counts are rising upwards of 20,000 spores/grams. December 2015 – The question was asked: Does FE occur in the Bega Valley? An ex-Gippsland dairy farmer, dairying in Bega for eighteen months, asked his Bega Cheese contact if FE was a problem in the Bega Valley as it was in Gippsland. After discussion amongst Bega Cheese, Dairy NSW, local veterinary practitioners and the District Veterinarian from the Local Land Services in Bega, it was determined that the incidence was unknown. There was no recollection of any outbreaks being definitively diagnosed. It was decided that given the atypical wet, warm summer we were experiencing, it was advisable that information be put out to, and the question be asked of, the farming community. March 2016 – Question answered: Yes, it does. CASE A. 7/3/16 Milking herd Dairy farmer south of Bega, who had asked the question, rang the DV – thinks he has an outbreak of FE. Ex-Gippsland dairy farmer moved into Bega Valley ~18 months earlier. Milking 300 cows on an 18 day grazing rotation in irrigated pastures which were a mix of annual and perennial ryegrass varieties and kikuyu. Fast rotation was to enable them to keep up with grass growth, keep the summer weeds at bay and reduce trash ready for their autumn sowing. Pastures were being topped after every third grazing. Pastures were top-dressed with nitrogen after every grazing. Had outbreak of photosensitisation 12 months ago. 15 cows affected, 2 died, sold 12, kept 1. Nil private veterinary/DV involvement. 28/2/16 - Milkers noticed to be inappetant plus a number had malodourous diarrhoea. The owner had been away for the weekend, assumed the workers had left feed in the bins and the issue was mild grain poisoning. Couple of fresh cows were also noted to be pyrexic. 4-6/3/16 - (Friday and over weekend): 6 cows obviously developing inflammation of udders, teats, vulvas, nictitating membranes. 2/6 were stale cows, dried off, put out. 1/6 = repeat from last year - has remnant scarred skin - now biting at it, causing trauma. Additional 12 off milk, inappetant, very agitated, biting at selves, shade seeking. Unable to be milked in the afternoon as kicking cups off etc. ie ~18 down to once daily milking - morning only. Overall the milk has dropped by 5L/cow/day average over the last week. General agitation of cows in dairy, inappetance. Weather conditions: exceptional season, atypical summer for Bega Valley – warm overnight temperatures, high moisture levels, even when not raining (hasn't for couple of weeks) - getting heavy fogs in the mornings at times; high humidity. Examined 9 cows: 3 clinically affected with inflammation + 6 noted by owner to be agitated, off feed and milk, couple with mild inflammation of udder. All bloods were sent for processing to the State Veterinary Diagnostic Laboratory at Elizabeth Macarthur Agricultural Institute, Menangle. 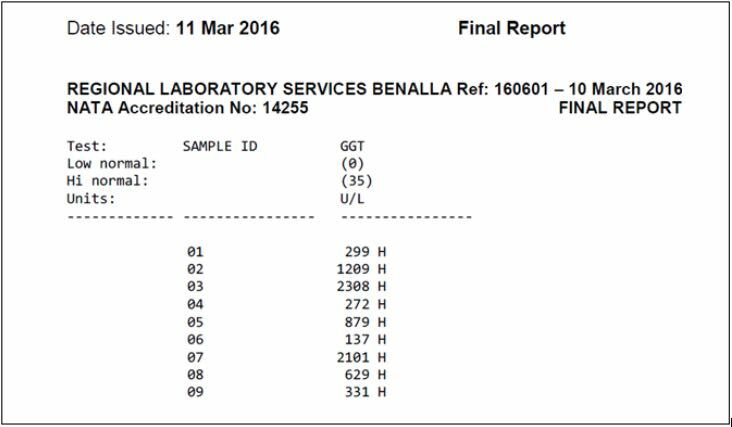 The processing of bloods for GGT levels was outsourced to Regional Laboratory Services Benalla. Sampled 6 paddocks for spore counting. 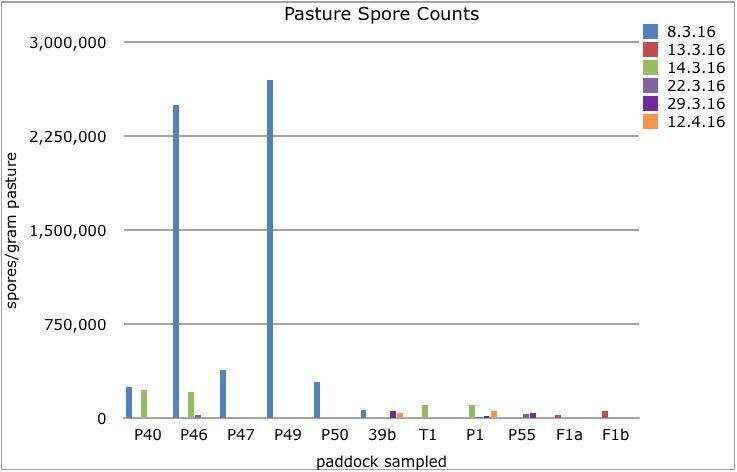 All pasture samples were sent to the Maffra Veterinary Centre, Vic, for spore counting. 13.3.16 sampled pasture doing a top cut (F1a), as cattle would access in a light grazing, and a lower cut (F1b) as per standard for pasture sampling for spore counting ie. down to 1cm above dirt. Results: F1a 25,000 spores/gram pasture, F1b 60,000 spores/gram pasture. Table 2. 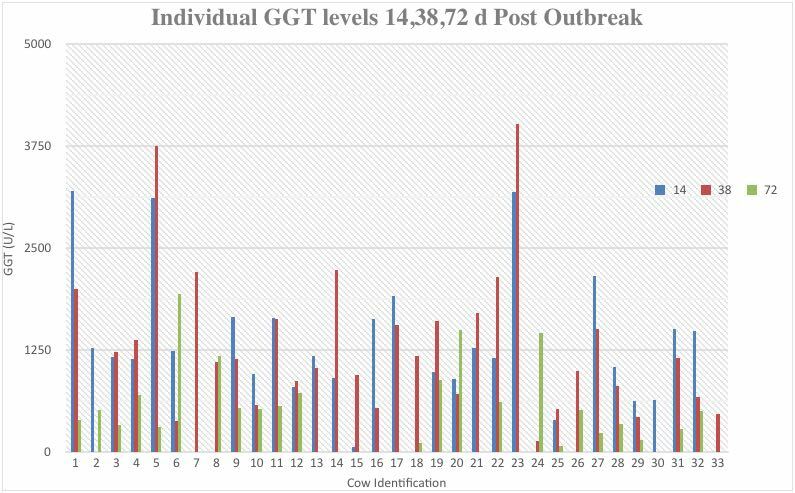 GGT levels in 5 cows sampled twice over 1 week. The elevation in GGT levels at the second bleed indicates the first bleed was taken early in the course of the disease. 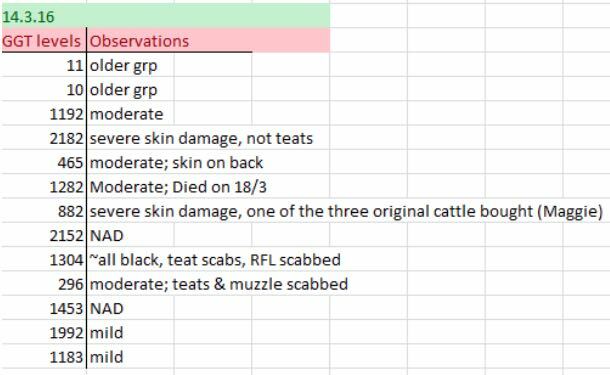 18.3.16 organised 2 affected cattle sent for slaughter to Young to have liver histopathology done; GGT levels previously recorded (ref samples 5 & 7 in Figure 1, and sample 1 in table 2). 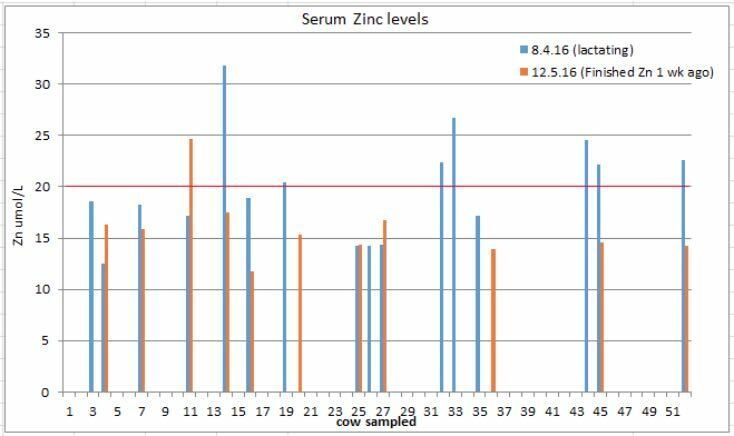 Tables 3 and 4 display the results of the blood testing for GGT and zinc levels. 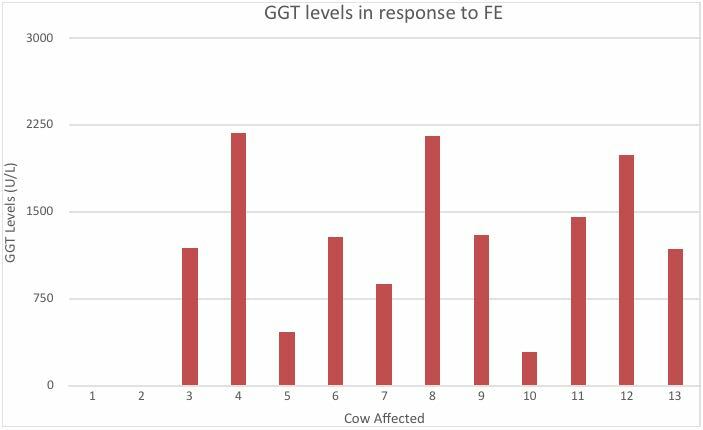 Table 3 demonstrates the variation in GGT levels amongst the cows and the variations in the GGT trends in individual cows over subsequent measurements. 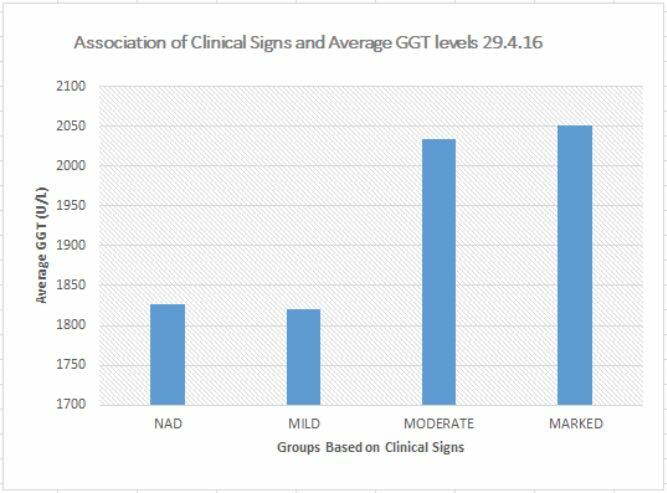 Table 4 however shows that the overall trend over time is a reduction in GGT levels. Table 6. Spore counts from a number of pasture samples, taken on six different occasions, highlighting the two million plus spores/gram of pasture identified on 8.3.16. Table 7. Spore counts as in table 6 with the two million plus counts removed to allow for the observation of more detail of the other counts. “With significant loss of cow numbers and the stage of production that our cows were in (majority freshly calved prepared to start a full lactation) combined with significant loss in milk production in our herd over the first three weeks and months following, as well as the extra fodder used to feed the herd in the crisis period, we estimate this has cost our business in conservative figures, $150,000 plus. Added to this, the emotional stress and extra work involved in managing this crisis was phenomenal.” Producer A.
Paddock 2 has not been mowed or topped; heifers were moved into that a few days ago; there is more bare dirt but significant leaf litter where there is pasture. Over half of the young heifers had varying degrees of skin lesions - white areas only, ranging from hair loss to thick sheets lifting; some with scabby teats, others with dorsum only affected, couple from face to tail affected. Blood sampled x 13; 11 x younger heifers – mix of clinically affected and not; + 2 x older heifers – not clinically affected. Ref fig 2. All 17 heifers died over a number of months. The cost of the loss of these replacement heifers is estimated to be a minimum of $30,000. CASE C. 22/4/16 Yearling heifers Dairy farmer north of Bega rang with a mob of 160 x 12 month old Friesian heifers, number showing signs of photosensitization. Owner noticed 2 heifers with photo signs 4th April; moved them to a new paddock 10th April. The latter paddock was sown September, cut once for silage. 24.5.16 Three pasture samples collected – two from the same areas of the same paddocks, and a new paddock the producer was concerned about. The remaining heifers were weighed on 29.5.16 and again on 14.9.16. Their average daily weight gain was compared with their GGT levels measured on 29.4.16. Ref table 11. 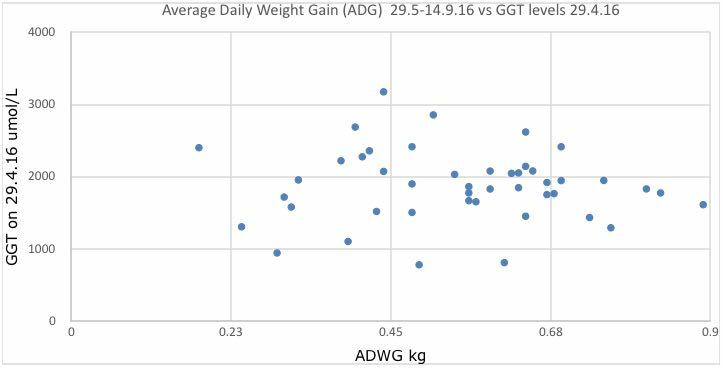 There does not appear to be a direct relationship between the GGT levels observed at the first testing and the average daily weight gains observed over a subsequent three and a half month period. 18 heifers died, lost contract for export of heifers to China – booked to export May 16. Producer estimates losses in deaths, lost export opportunity, increased feed utilized, delay in first mating has cost a minimum of $150,000. There has been a significant amount of producer education about FE over the first three months of 2017. This has occurred via local radio, newspaper, producer networks and an information evening held late February. 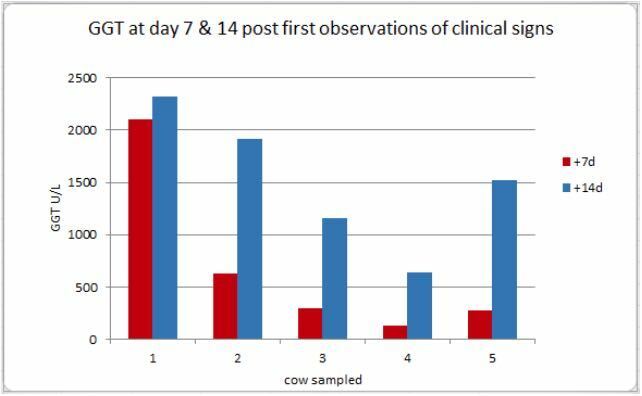 Due to the collection of the above data from pastures and affected cattle confirming outbreaks of FE in the Bega Valley in autumn 2016, Dairy Australia (DA) incorporated the Bega Valley into their 2017 GippsDairy Facial Eczema Spore Monitoring Program. The program has been running in Gippsland for a number of years to great effect. DA funding has allowed the engagement of three sentinel farms in the region (Quaama, Bemboka, and Candelo) who are submitting pasture samples to the Bega Veterinary Hospital every one-two weeks. Spore counting to monitor the situation will last from January through to April, as this is the typical period during which outbreaks of FE occur. The results of the spore counting are made available on the Dairy Australia website. The risk of FE occurring increases when pasture spore counts are trending upwards of 20,000 spores per gram of pasture, minimum night time temperatures are over 12-15 degrees Celsius and the humidity is greater than 90%, for a few days. 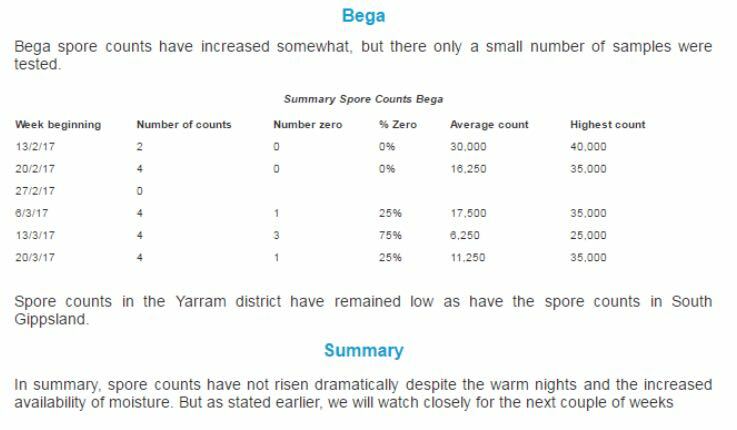 If the risk of FE does increase in the area according to the above indicators, alerts will be sent to Bega dairy farmers and other producers in the Valley via the media and producer networks. Producers will be recommended to submit their own pasture samples to the Bega Veterinary Hospital to gauge their individual situation. There is some funding available to facilitate these extra spore counts as we endeavour to gain a picture of the FE risk in our area. 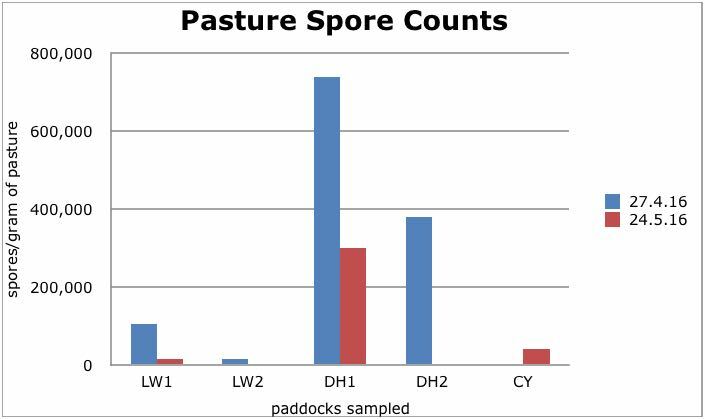 Producers will be reminded that spore counts can vary dramatically amongst districts, farms, and even amongst paddocks on the same farm. Producers with at-risk dairy cattle will be advised to consider administering zinc oxide in the feed as a preventative for FE. Special attention will need to be given to the method and dose rate, as over dosage can result in significant toxicity issues. Management of dry dairy cattle, bulls, and other livestock, to minimise their exposure to toxic levels of the spores will need to be conducted as administration of zinc oxide via feed to those stock is rarely practicable. 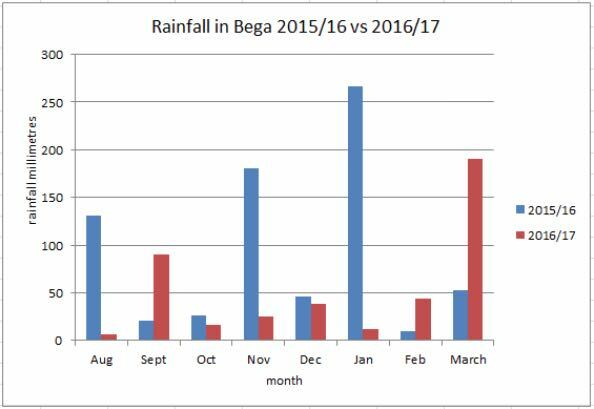 The hot and wet summer of 2015/16 was atypical for the Bega Valley. This led to an abundance of on-ground feed encouraging the buildup of dead leaf material on paddocks plus the practice of topping pastures. The summer of 2016/17 was much drier. While autumn has brought warm nights and significant rain, there is not the buildup of dead pasture material to encourage the abundant growth and sporulation of P. chartarum observed last season as shown in Figure 5. 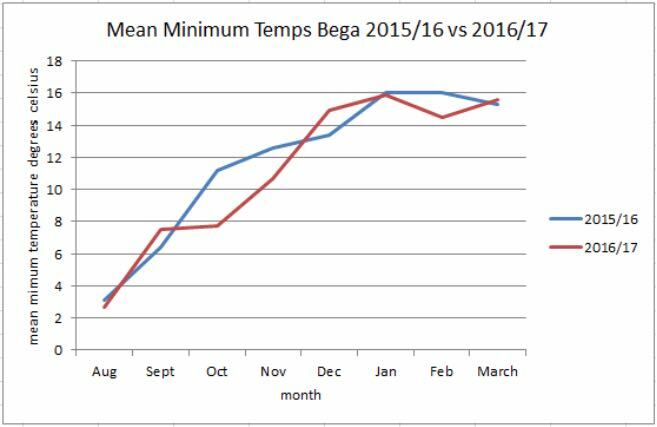 The tables below illustrate the differences in monthly rainfall and monthly mean minimum temperatures over the months of August through to March 2015/16 and the 2016/17. Communication amongst producers and veterinary advisers is vital to enable early intervention in new, or previously not widely recognized in the local area, animal health issues. The promotion of good pathways of communication, utilizing local resources, is important. Sometimes it’s not what you know, it’s who you know and get to know, that can make a significant difference to the conduct of an investigation. The expertise and support of an experienced professional on the subject, the financial support of government and industry can be enormously constructive at the time and into the future. Bega Valley producers, their industry networks and their veterinary advisors are now significantly better informed, and prepared, for future potential outbreaks of FE. While the ability to predict outbreaks and the effects on individual animals of FE is evidently imprecise, producers are now in a position to strategically implement preventative strategies to attempt to avoid the impact of FE. How can the toxicity of individual spores be determined? How does aging affect the toxicity of spores? How does utilising a pasture with a high spore count for hay or silage affect its toxicity? How useful are GGT levels as a predictive indicator of what the short, medium and long term prognosis is for an animal affected by FE? What levels of serum zinc are actually required to achieve a protective affect? For how long can zinc be safely administered to an animal? The collection of more data, the longer term follow up of affected animals, and further research into the toxicity of the sporidesmin containing spores of P. chartarum, are areas worth pursuing in order to give us greater understanding of this unpredictable, significant disease of ruminants. The affected producers in the Bega Valley for their patient co-operation, resilience, and generosity in sharing their experiences for the benefit of the wider farming community. Dr.Jakob Malmo for his willingness to share his expertise, his time, and to count an abundance of spores. DPI for providing the funding to conduct the blood testing in this disease investigation. EMAI pathologists for their assistance and interest in the cases. GippsDairy, Dairy Australia, for funding the spore counting in 2016 and including the Bega Valley in their 2017 FE Spore Monitoring Program. Libby and Sandra Summerrell, final year CSU vet students 2016, for collating much of the data.